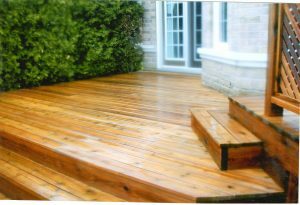 Although it might sound silly – hiring a professional technician that has been trained to pressure wash decks is important to the cleaning process. 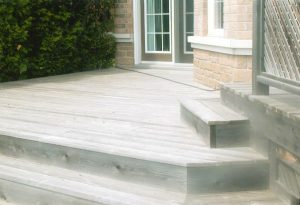 Unlike other external surfaces around your property, cleaning your deck properly requires a lot of technical knowledge. If done wrong, the damage could be permanent. By uUsing the right water pressure and detergent to remove the dirt, mold and algae build-up will lay the foundation for the next steps. If done incorrectly you will see streaks and water marks this is due to using the wrong water pressure and detergent. 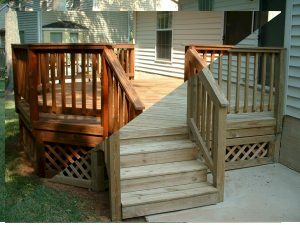 Once your deck has been pressure washed it needs to dry so it can be treated with a sealer to bring back and hold its natural beauty. It typically takes 2-3 days to dry in warm, dry conditions. Because this step is necessary in order for the wood to accept the sealer – our technicians will check it with a moisture meter just to be sure.